Russell Woodard 'Sculptura' patio chairs in wrought iron and red lacquer, United States, 1950s. 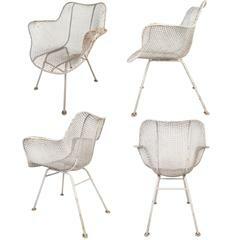 These 'Sculptura' patio chairs, which can be used as dining chairs as well, are in iron and woven steel. The intertwined steel creates a mesh and creates a linear grill. These chairs can be placed in an inside environment or the outside making them dynamic and easily adaptable chairs. 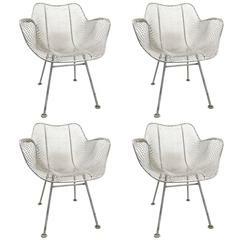 The metal mesh is an excellent manner in which these chairs create a vibrant, light touch that is so perfect for those summer days. A good pair of Russell Woodard sculptura chairs in original paint with good patina.